This is a map from my Deathless Gods campaign. 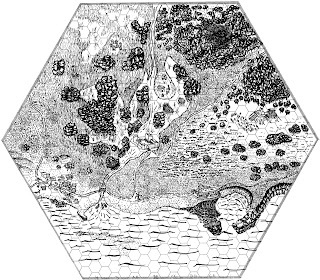 On this map you will see the Seamoor community in the lower left, a house on a moat, an alchemist's house, and a temple. Also there is a mysterious forest with a witch's hut. I used various modules and inserted them in this six-mile hex. As a working artist, I'd have rates if anyone would like one of these for their campaign or a product. I'd be interested in learning more about these rates. I have no specific project at the moment, but could see this being quite useful. Wow, holy crap. That is nice. And I love the, I get bigger, part. I may have to steal that from you. I just want to say that I had a blast tromping through this hex for...what, one year? Chock full of adventure and choices. Very nice. I love the hex map where the landscape dominates the grid, rather than the grid dominating the landscape. Now that's a rich piece of gaming, right there. I love the signposts at the crossroads. Really nice touch. Can you explain how you key it? I'm seeing some numbers / letters down at the bottom, but I'd love to start illustrating my gaming maps like this too!